How do the rugged Android Wear smartwatches compare? This is a new era for Android Wear. The traditional watchmakers have joined the party, ready to put their own unique spin on how to make a Google powered smartwatch. First up we have the Casio Smart Outdoor Watch WSD-F10, (we know, it's a mouthful to say), the first Android Wear smartwatch built for the outdoors. That was soon followed by the Nixon The Mission (yes, The Mission) that's also designed to brave the elements. So we have two new rugged Android Wear watches and the obvious question to ask is which one is going to be a better fit when you're climbing the nearest mountain or sailing the seas? We've compared the specs and weigh up the designs to see how the two match up. Yes, it's time for a smartwatch showdown. If you're expecting the same kind of slim form factors we've seen with the likes of the Moto 360 2 or the LG Watch Urbane then you're sadly out of luck on both fronts here. With the Casio, you're getting a bulky looking watch with a 33.5mm watch case that's not going to sit well with a nice shirt in the office that's for sure. It's a similar story with the Nixon smartwatch. Its 48mm polycarbonate watch case makes it a chunky beast as well. The Casio is lighter than it appears, weighing in at just 93g. We're not sure how much the Nixon weighs yet. Both are designed with the outdoor world in mind. Casio uses a US military standard MIL-STD0810 of dust and shock resistance. It's also waterproof up to 50m. The Nixon meanwhile is similarly military grade dust and shock resistant with a 10ATM water resistance rating giving you resistance down to 100m. That's 50 more metres than the Casio Android Wear watch can manage in the watery depths. If customisation is your bag, both offer the ability to mix things up, but you can get more variety with The Mission. There's over 20 silicon watch strap options and 15 different bezels to choose from including gunmetal and gold options. Casio's Android Wear watch meanwhile is available in orange, black, green and red that gives it a steely, stylish look and gives a more striking appearance than most current outdoor watches. On the screen front, the Mission packs a larger 1.39-inch AMOLED, 400 x 400 resolution screen and it's a full circle. There's no flat black tyre to see here. There's also a raised stainless steel bezel to protect the touchscreen from damage. Casio opts for a smaller 1.32-inch, 320 x 300 LCD display, which is by no means cutting edge. It does however come with a second monochrome display mode that should improve its staying power. The downside though, is that all of the useful sensors will be disabled in this mode. Take a look through the specs sheet and there's one thing that immediately stands out and that's GPS. It features on The Mission but not on the Casio, which is somewhat surprising and will disappoint any trekkers eyeing up the Casio Android Wear watch. Away from the notable absence of GPS, the Casio does pile on a whole host of other sensors. There's an air pressure and altitude sensors as well as a magnetic compass. You'll also get an accelerometer, pyrometer and magnetometer. These can be put to good use with a dedicated button show charts on your current direction, sunrise and sunset times and tide graphs for adventurers on the go. The Nixon doesn't shy away from the sensors either. You'll get a thermometer, altimeter, barometer, compass, gyrometer, accelerometer and humidity sensor. All the sensors are accessible by any Android Wear apps, meaning you can hook it up with your favourite running, cycling, surfing or skiing tracker. In the power department, the two are evenly matched. Both are powered by the Snapdragon 2100 processors with 512MB of RAM and 4GB of internal storage. That's in line with what we've seen from current Android Wear watches and should be suitable to keep Google's OS running smoothly. Battery life is level pegged if you want to use them to their full potential. You can expect to get through a day's play, while the Casio can eek out more life in its monochrome mode. As we've mentioned though, you're having to sacrifice its core features to do so. Speaking of Google's operating system, both outdoor watches get the same Android Wear treatment. You'll be able to download apps from the Google Play Store and both have microphones onboard so you can bark orders through Google's voice search. While Google is pretty rigid with companies tinkering with its software, you do get some unique touches in the way of integrated apps and watch faces. The Mission comes with a selection of watch faces that mirror the company's line of analogue watches for instance. It's also bundled with bespoke apps to full embrace the onboard sensors. The Nixon Mission app delivers real time surf and snow conditions while the Trace app will let you attach a puck to surf or snowboard to track speed, distance and time spent. 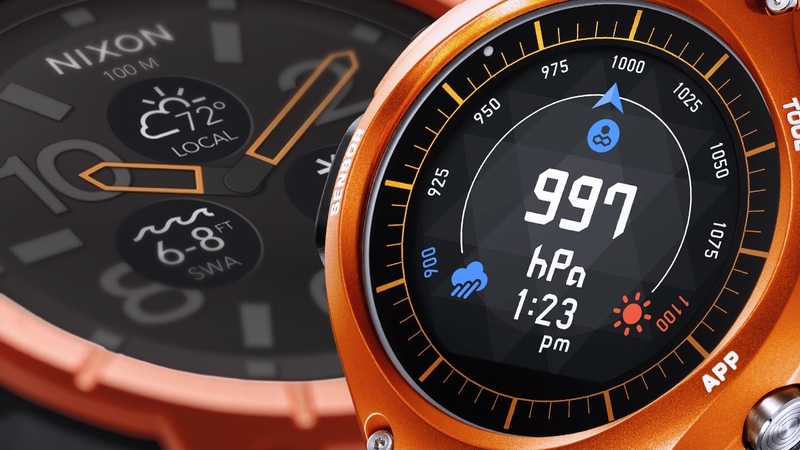 Over with the Casio, you can expect some customised watch faces as well and a selection of pre-installed apps optimised for outdoor activities like fishing, trekking and cycling. It will also play nice with the ViewRanger GPS app for trekking routes. The Casio Outdoor WSD-F10 watch will set you back $500 and is on sale now. The Mission meanwhile, which lands in October 2016, comes in at $400, which undercuts the Casio by a solid $100. On paper, it's fair to say that there's very little between these two Android Wear outdoor watches. You're going to get rugged, bulky designs either way and largely the same Android Wear experience. The Mission though has a bigger screen, better waterproofing and it does have GPS. Plus it's considerably cheaper. That could be a massive sway for most choosing between the two. We'll have to wait until we have our full reviews to give you a comprehensive verdict, but we're inclined to side with The Mission for now.